Happy New Year! Time to set aside all those holiday treats and get back into the healthy eating (kudos to you, if your waistline didn't expand a bit during the season of indulgence). 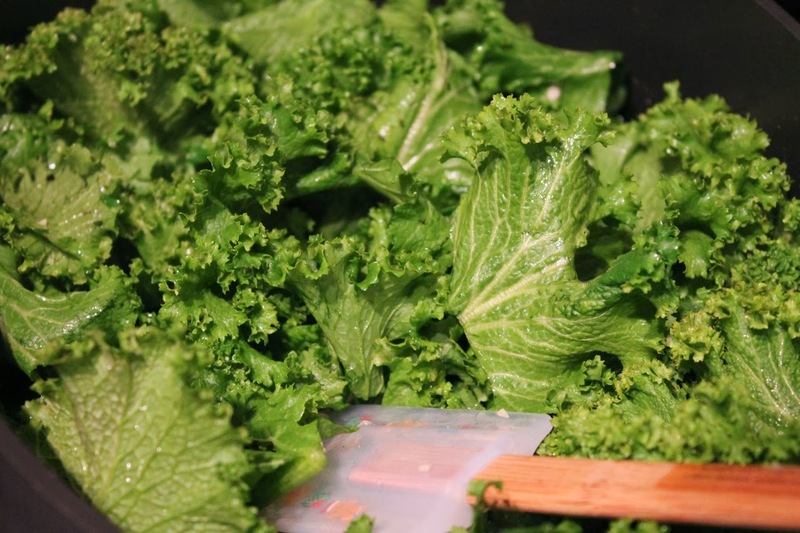 A good place to start: fish and greens. I really liked combination of mustard and salmon in the Mustard-Broiled Salmon with Miso and Honey Braised Greens. I thought I'd try taking the mustard a step further by pairing the fish with mustard greens. 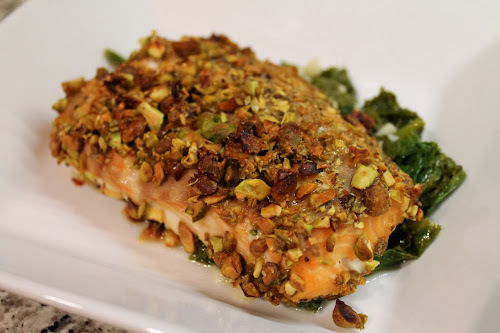 I found this recipe for Pistachio-Mustard Salmon, which I thought would be just the thing to pair with mustard greens. This dish is very flavorful, but not spicy. If you can only find salted pistachios, consider reducing the salt mixed in with the nut coating. 2. In a shallow bowl, combine the honey, mustard and lemon juice. Add the salmon fillets and turn to coat. 3. Chop the pistachios to a coarse crumb. Combine with the oregano, salt and pepper and transfer to a plate. Dip each honey-mustard pieces of salmon in the pistachios, pressing down gently to coat, and transfer the salmon piece to a baking dish. Spoon any remaining pistachios over the fillets. 4. Bake salmon until fish flakes with a fork and is the desired doneness, about 20 to 25 minutes. 1. Heat olive in a steep-sided skillet over medium-high heat. Add greens and garlic and sauté until the greens are wilted, about 5 minutes. Add the wine, stir to combine, cover and reduce heat to medium-low. Simmer greens until tender, about 10 minutes. 2. Remove lid and continue to cook if there is excess moisture in the pan (greens shouldn't be completely dry, but you don't want them swimming either). Turn off the heat, add the white balsamic vinegar and stir to combine. This was very good. Love them pistachios. They complement the salmon nicely.